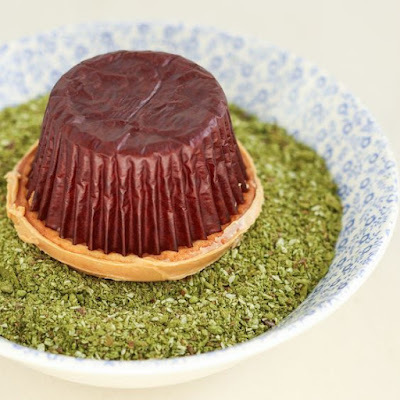 I prepared this recipe especially to celebrate Easter, and adapt this recipe from Thirsty for Tea (a beautiful blog)because her recipe to make the moss is wonderful (matcha). I wanted to use chocolate bunnies but there were only big ones. Finally I made cookies with a bunny shape but you can use whatever you want. Usually are for tea but are beauty and edible. The recipe for chocolate cakes is for 6 (for me Ok) but you can double the amount if you want more. I wish everyone a Happy and blessed Easter to all! With a stand mixer or hand mixer combine sugar, flour, cocoa powder,baking powder,baking soda and salt. Add eggs, milk, oil and vanilla extract and beat for 2 minutes. Add hot coffe and beat until just combined. Divide evenly between 6 prepared muffins cups. Bake for approximately 15 minutes, until the tops spring back when you touch them and a toothpick inserted into the center comes out clean. Dip the top of the cupcakes in the matcha moss. Let the cupcake sit for a few minutes, then dip it in the moss mix a second time. Repeat for all the cupcakes. If you d like add some flowers or candies.